Grant of Advance for purchase of land or part/full construction, enlargement etc., of a house. Revised APAR format for various Scientific Positions. Gradation of IVRI staff in different cadre pertaining to the strength of E-II section. Final Gradation Lists of Administrative Staff(Assitant,UDC,LDC,Steno Grade-III & PA etc.) and Technical Staff(against the sanctioned posts of Category-I & II i.e. T-1 to T-4) of the Institute as on 01.01.2017. GRADATION LIST OF ASSISTANTS IN PAY BAND–II OF RS. 9300-34800 + GRADE PAY RS. 4200/-. GRADATION LIST OF ADM. STAFF OTHER THAN MINISTERIAL STAFF. GRADATION LIST OF TECHNICAL PERSONNELS. Final Gradation Lists-2016 of Administrative Staff(Assistant,UDC,LDC,Steno Grade-III & PA) and Technical Staff on 01.01.2016. Final Gradation List of Assistants-2016. 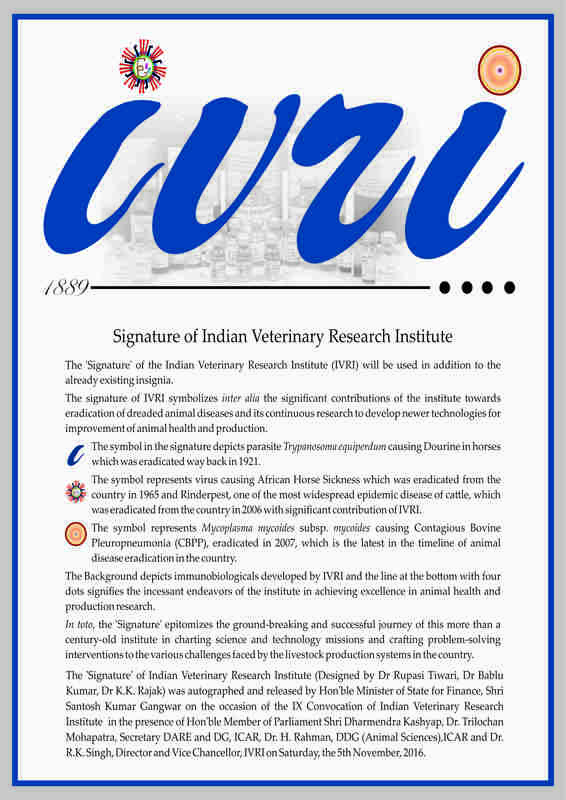 Proceedings of The Sixteenth(XVI) Meeting of Extension Council of ICAR-IVRI,Izatnagar. Proceeding of Meeting of Vice - Chancellors of Agricultural Universities and Directors of the ICAR Institutes held on 14th to 16th May, 2015 at NAASC Complex, Pusa, New Delhi. Proforma for Traveling Allowance Bill.